As I said yesterday, the RV Doctor was going to be at the campsite "first thing in the morning." I guess our definition of first thing and his were a bit different. We had packed everything and were ready to roll by 8 AM. The only thing we needed to to get out of Foxboro was to hook up the truck and disconnect the utilities. Doctor Carl arrived around 10 AM and we proceeded to remove the old refrigerator and install the new one. The whole process took around 45 minutes. The refrigerator was turned on and we were out of the campground by a little after 11 AM. There was no reason why the refrigerator would not work,. However, when we left we didn't know if the operation was a success. It takes a few hours for the unit to cool down so we would not know for sure until we made our first fuel/lunch stop. It works!!! The run to Bar Harbor was relatively easy. 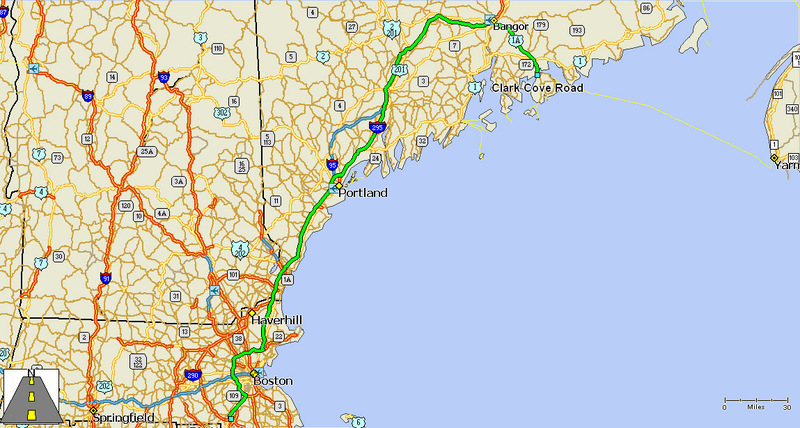 We picked I-95 a few miles north of the campground and essentially stayed on it until Bangor, where we turned southeast for the coast and Bar Harbor. We made good time and were in the campground by 4:45 PM. This is not the routing I had originally planned. It was our intent to follow US 1 up the coast of Maine all the way Calais. The trailer problems took care of that plan. In fact, we are looking at coast of Maine portion of this trip as a loss. It is not that far from home and we can always come back here on a short trip. Another reason why the Maine portion of the trip is write off is that we had planned to be in Bar Harbor for two days before the Fourth of July and use that time to look around the area, perhaps rent a kayak and explore the coast and just walk around the town. We were going stay out of the town on the Fourth. When we checked in at the campground, we were told that driving into Bar Harbor tomorrow will be foolish. The town is absolutely packed and parking, normally difficult to find, will be impossible. It was suggested that we take the free shuttle into town and back. In reading the literature we received on check in, we found that the normal shuttle schedule will not be running tomorrow. If we wanted to stay for the fireworks, it may take several hours to get back to the campground because of the heavy traffic leaving town. We have decided to play tomorrow by ear and either make the run into Bar Harbor on the shuttle bus or just stay in the campground and relax. The campground is a little different from anything we had encountered before. It is really two campgrounds about a mile and half apart. The first of the two campgrounds is on the water right after you get on the island and the second is a wooded campground a bit inland. We could not get a waterview site because there were none available with a full hook-up. So we are in the wooded park with its annoying mosquitoes.